After making all of the Sailor Scouts and Tuxedo Mask I couldn’t leave out my favourite characters Luna and Artemis! 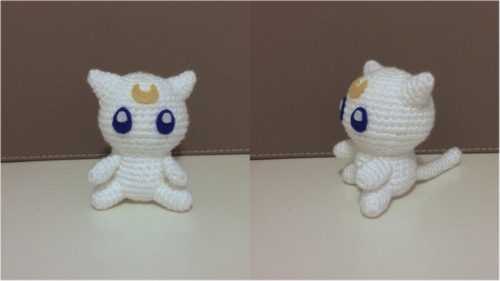 I wanted to try my hand at a different style amigurumi for some animal and Pokemon characters and ended up with this pattern. It’s so simple and works up so quickly! Colour A will be Black for Luna and White for Artemis. (You could also go Grey for Diana, but I’m going to try to work out a slightly smaller pattern for her). Leave a tail for sewing and finish off. That’s all of the pieces done! Stuff the body, head, legs and ears (if they need it). I like to pin all of the pieces in place to get an idea of placement before sewing them on. Then I just sew them all in place! 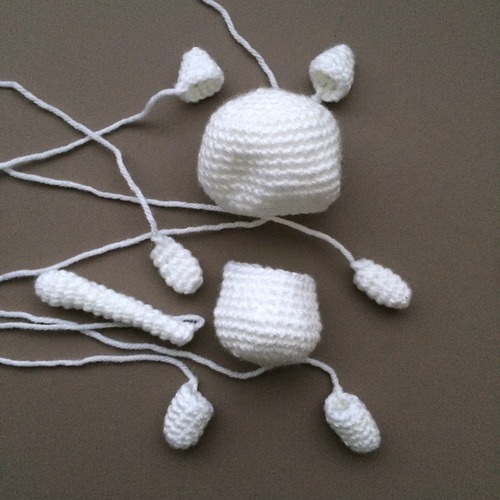 I attach the tail first, then the legs, the arms, the head, the ears. I find it easier to attach the head before the ears because they always end up wonky when I attach them first. Last thing left to do is make the facial features out of felt. 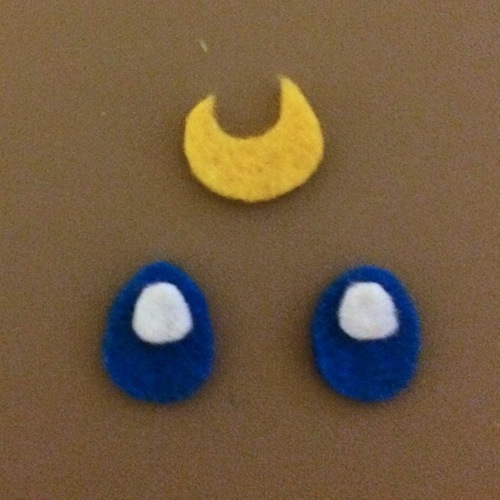 Both Artemis and Luna need yellow felt for the crescent moon on their forehead, and white felt for the pupil/shine in their eyes. Luna has Red eyes, and Artemis has Blue eyes. Diana also has Red eyes. You’ll need to cut out two red or blue ovals, and two smaller white circles for the eyes. Then glue the white circle onto the oval, and then glue the eyes to the face, and the crescent moon to the forehead! That’s Artemis (or Luna) done! 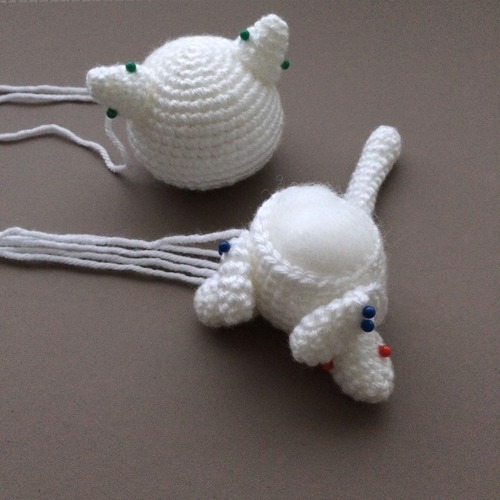 These work up so much faster than my human dolls and are heaps of fun to make because they’re so simple. A great project for beginners.